Free Barre Class: Curious what barre is all about and why everyone leaves class unable to walk from all the pulsing and tiny movements? Check out this free class from Bad to the Barre in Somerville, where you’ll perform small and controlled isometric movements while you build strength and endurance. Free, 6:30 p.m.-7:30 p.m., Dance Union Studio, 16 Bow St., Somerville, eventbrite.com. Rev’d Outdoor Ride: This will be the last outdoor ride of the season from Rev’d, so make sure you reserve a spot on a bike. Space is limited to the first 30 people. Free, 4 p.m.-5 p.m., New Balance Flagship, Boston Landing, 140 Guest St., Brighton, eventbrite.com. Nutrition Cooking Class: Meal-prepping can be hard, we know, but Chef Nathan Diaz from Nutrition for Performance is going to show you how to kick up the flavor in your weekly menu. Learn his tips and tricks while sampling some of the recipes in this cooking class. $5, Boston Fit Body Boot Camp & Gym Training Room, 24 Cambridge St., Charlestown, facebook.com. 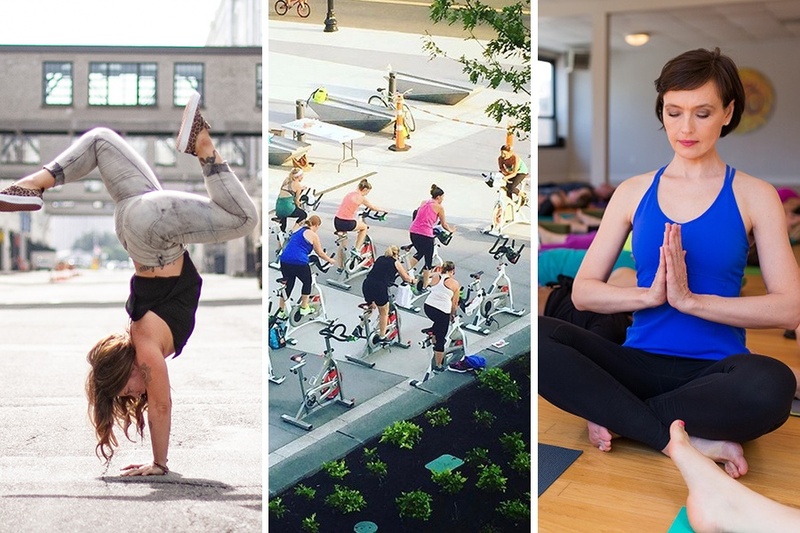 Fiercely You: Join fitness and wellness experts/coaches Catie Macken and Katie Grimes for an evening of connection and conversation at Reebok HQ. You’ll dig deep into navigating relationship dynamics, approaching difficult conversations, as well as how to improve your career. Bring a journal and a pen and leave with actionable steps to bring into your everyday life. $35, 5:30 p.m.-8 p.m., Reebok HQ, 25 Drydock Ave., Boston, eventbrite.com. New Balance Kicks Cancer: Come kick cancer with Kick It By Eliza at the New Balance flagship store at Boston Landing. You’ll hear inspirational stories from breast cancer survivors before taking part in a Kick It class to tunes of DJ Sprino, followed by shopping and treats. Suggested donation of $10, 5 p.m.-7 p.m., New Balance, 140 Guest St., Brighton, eventbrite.com. Healthy Baking Workshop: This hands-on workshop will have you elbow-deep in recipes like raspberry-coconut donuts, molten lava cake, and salted caramel brownies. The best part? Each treat has a healthy twist to it. $20, 6 p.m.-9 p.m., Boston Center for Adult Education, 122 Arlington St., Boston, bcae.org. B/Spoke Halloween Party: Join B/Spoke’s team for a night of fun at their studio and come dressed in your best famous musician or band costume. Treats and drinks will be provided, as well as killer beats. Free, 7:30 p.m.-10 p.m., 101 Federal St., Boston, facebook.com. Handstand Workshop: Learn the proper steps of flipping upside down and holding a handstand in this workshop at Coolidge Yoga. It’s open to all ability levels and even though it’s focused on handstands, your entire inversion practice will benefit from the techniques taught. $30, 12:15 p.m.-1:45 p.m., Coolidge Yoga South End, 15 Worcester St., Boston, coolidgeyoga.com. Flow at Publico: Head to Publico’s garden for an all levels vinyasa class hosted by East Side Yoga and Fitness. After the class you’re welcome to head down to the main restaurant to enjoy brunch and specialty cocktails. Bloody Marys, anyone? $15 cash-only, 10 a.m.-11 a.m., Publico Boston, 11 Dorchester St., Boston, facebook.com. Socatology: Ready for “reggaerobics”? Start your Saturday off with a party of Caribbean flair in this cardio dance class paired with high intensity interval training for 60-minutes of fun. All fitness levels are welcome, and if you refer two friends, your admission is half off. $10, Lamberts Fitness Center, 735 Morrissey Blvd., Boston, eventbrite.com. Gentle Stretch and Strengthen: Looking for something a little gentler on the body? See what Human Harmonies, specializing in Tai Chi, is all about. This class complements their traditional class and works to bring mindfulness to your movements coupled with breath work. Free, 8:45 a.m.-9:45 a.m., 1739 Centre St., West Roxbury, facebook.com. Women’s Bike and Brunch: If you don’t have a bike, don’t fret. A Bluebike will be provided for you to take a leisurely round trip ride with other women starting at Mattapan Station, following the Neponset Greenway, before stopping at Lucy’s Tavern in Dorchester for brunch and socializing. Free, 10 a.m.-2 p.m., Mattapan Station, 500 River St., Boston, eventbrite.com. Buti and Brews: Check out what this yoga fusion class is all about—blending cardio, tribal dance, plyometrics, and vinyasa yoga all in one. One beer from the Trillium Brewery comes with the purchase of your ticket, but make sure to bring your own yoga mat. $20, 9:15 a.m.-10:30 a.m., Trillium Brewing, 110 Shawmut Rd., Canton, eventbrite.com. Learn to Meditate: Ever tried to meditate and you just can’t seem to shut your brain off? Drop into this meditation workshop, where you’ll learn meditation techniques so you can head into your week with a clear mind. $40, 1:30 p.m.-3:30 p.m., Health Yoga Life Boston Studio, 12 Temple St., Boston, healthyogalife.com. Halloween Family Yoga: This special yoga class will feature music, storytelling, breath work, and relaxation methods inspired by the Halloween spirit. Bring the kiddos for this 45-minute flow. No experience is necessary. $20 (1 parent and 1 child), 3:30 p.m.-4:15 p.m., Radiant Yoga Boston, 516 E 2nd St., Boston, facebook.com.